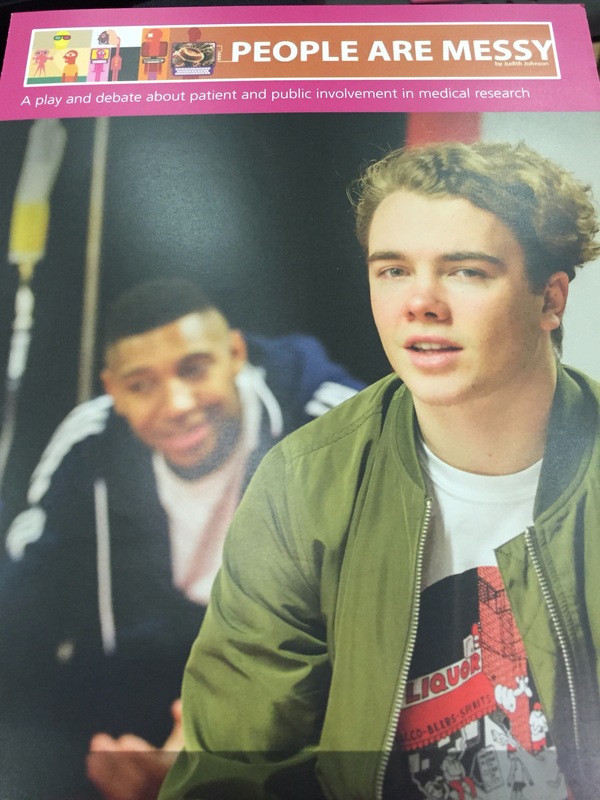 The play – aimed at young people – has been produced by the Theatre of Debate with the support of the NIHR Oxford Biomedical Research Centre and it’s causing quite a stir. It was developed with patients as part of the ‘company,’ developing the idea and advising on the script. It is currently touring schools up and down the country. ‘People are Messy’ tells the story of a passionate and committed young person, Jake, coming to terms with a diagnosis of a rare disease that has already caused family tragedy. Out of this frightening personal drama emerges an unlikely comradeship with fellow sufferer, Vic. It is a friendship that leads Jake into the world of medical research and public involvement. The playwright Judith Johnson has worked her magic in bringing a difficult and often impenetrable subject to life. It lifts, it moves, it makes one think. All in equal measure. This is high-class theatre, performed by an excellent cast and the results are compelling. When the play is performed in schools, young people get to discuss and debate the issues afterwards with the cast and crew. On Wednesday night we saw some vox pops of young people talking about their impressions of the play. We also got to debate the issues ourselves. In the vox pops it was heartening to hear these young adults talk about how the play had got them thinking: that they would want to be involved if they were a patient; that it had made them see the value of the patient voice in shaping research, in making things happen. Surely these are strong and positive messages we would all welcome whatever part we play on the real-world stage that is health research. In this digital/social media/technology obsessed world we discount other media and their ability to communicate and connect all too easily. As a parent I can tell you that drama has the ability to reach young people – and adults for that matter – in a way that is deep and long-lasting. From ‘Cathy come home’ to Eastenders drama has been at the forefront of social reform and changing social attitudes in our society. It may not be to everyone’s liking and some people may question its value – that is their right. But as i am sure Jake would say: sometimes you have to stand up for what you believe in.